When I think of spring veggies, I automatically think of asparagus. Along with rhubarb and the first strawberries, asparagus is one of the first plants that reach peak freshness. It’s also full of tons of vitamins (A, K, E, and B6) and minerals (folate, iron, copper, and calcium), and a prebiotic fiber called inulin that feeds the beneficial bacteria in your gut. It’s also my go-to for when I’m feeling a little bloated. The green contains lots of an amino acid called asparagine that acts like a natural diuretic and is also a great source of polyphenols. And that gorgeous purple variety is high in antioxidants. The skinnier stalks, which are easier to find this time of year, have more fiber than the thicker ones. So really, you can’t go wrong when ingredients shopping. I’ll eat asparagus any way you serve it to me—steamed, grilled, or grated raw into ribbons for a salad—but lately I’ve been using it in this super-simple springtime, nutrient-packed vegan soup. I use kombu—an amazing seaweed you can find in most health food stores—as the base for the broth to provide the same umami flavor you get from using, say, chicken stock. Then, I caramelize some fresh leeks (also in season! also a powerful prebiotic!) with some vitamin-E-rich avocado oil (my new obsession). Then there’s one more step: lightly blanching the asparagus in the broth and leek stock before whipping it up in a high-powered blender. That’s it! If you want to get a little fancy, you can throw on some home made croutons. I try to always use breads made from organic, non-GMO heirloom wheat, like La Brea Bakery’s artisanal-grain Fortuna loaf, and throw in whatever fresh herb I have on hand, like thyme or rosemary. Sprinkle a few of those salty, crunchy babies on top and you’ve got a light lunch or dinner that’s like springtime in a bowl. For some extra flaire, you can reserve some of the asparagus tips, chop them, and serve them on top of the soup with a fresh herb (here, chives) and croutons. The soup can be served hot or cold. I like eating it with poached or sliced eggs but vegans might consider throwing in some tofu for extra protein. Vegans can also throw in one whole avocado before blending. It adds a little creamy richness and a very subtle avocado note to the taste. Add the kombu and three cups of water to a pot over medium heat. Bring to a simmer and turn off heat. Cover pot and let sit for an hour. In a large pan over low heat, add avocado oil. Chop the white parts and some of the lighter green part of the leeks in half-inch rounds. Add to pan and cook, stirring occasionally, for 20 minutes. Add broth and increase heat to medium. Bring to a simmer and add asparagus. Cook until asparagus is tender and bright green but not soggy, about five to seven minutes. Transfer to a high powered blender and blend until smooth. Return to pan to keep warm. Salt to taste and serve. In a small bowl combine bread pieces, oil, salt and herbs. Mix with hands and transfer to baking sheet. Place in oven and bake for eight to ten minutes. Flip croutons over and bake for four to five minutes more, or until golden and toasted. Remove from oven and let cool completely before transferring to a glass storage container. Serve with soup, salads, or enjoy as a snack. 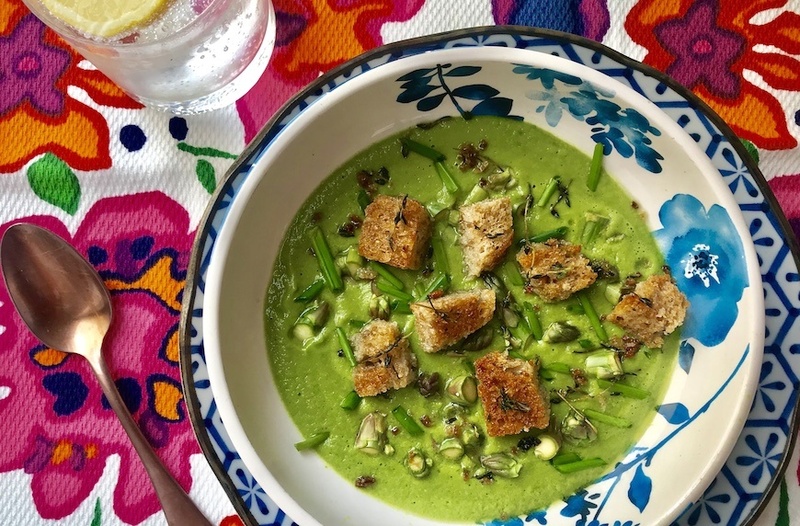 For more ideas on how to use your farm-fresh asparagus, try this recipe for cold yogurt asparagus soup or this recipe for shaved asparagus and mint salad.